It is just after sunset and hundreds of people have gathered around the docking bays of Minamiboso on the southern edge of Chiba Prefecture. As men bang away on taiko drums, dozens of women emerge from a hilltop shrine. Dressed head-to-toe in white outfits and wearing goggles on their heads, they carry lit bamboo torches and walk, two-by-two, toward the docks. These are ama (female divers), and as they wade into the water to form a circle, onlookers watch in near silence — save for the sound of digital and analog shutters. This photogenic custom is part of the Ama Matsuri, a traditional festival held every year during Ocean Day or Marine Day weekend (this year it’s on July 18). 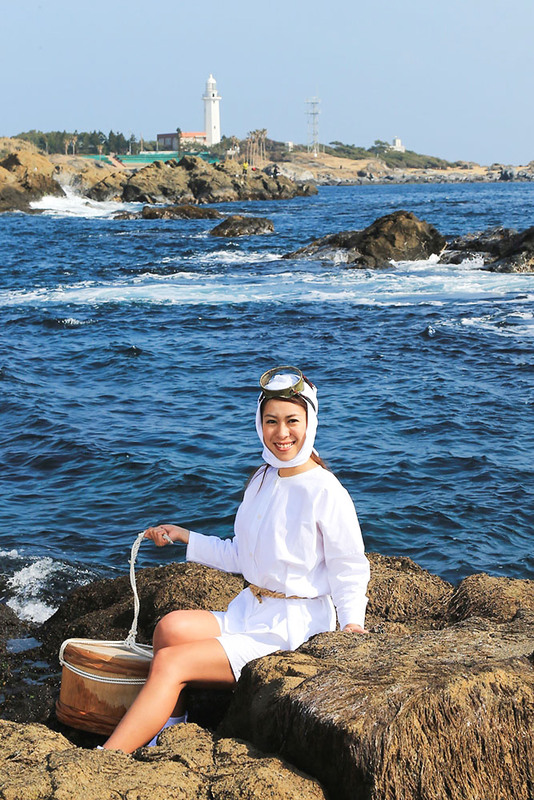 It’s a celebration of the legacy of female divers in Minamiboso, and after years of being enjoyed by mostly local Japanese, the city’s community recently decided to promote it as a tourist attraction to help make the ama, and the seaside area, become more well-known. 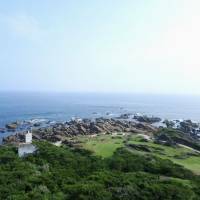 The promotion is part of a campaign that aims to re-brand the relatively unknown area into an accessible summer getaway. Tourists readily flock to Japan’s popular beach vacation spots such as Okinawa and the Izu Peninsula, but Minamiboso boasts something such destinations don’t — its convenient location, just a few hours drive from Tokyo, and attractively low costs for travelers from the metropolis who are short on time and money. Several groups are currently helping promote the city to foreigners, including the Minamiboso City Tourism Promotion Section, which is reaching out to international tourists from the moment they arrive in Japan. “We are holding PR campaigns at Narita Airport and creating tourism pamphlets in languages other than Japanese,” said Katsuyuki Nagai, subsection chief of the Tourism Promotion Section of Minamiboso City. He also said the group plans to work with local minshuku (guesthouses), ryokan (Japanese-style inns) and hotels so they are better prepared to cater to foreign guests. The International Artists Center (IAC), a nonprofit organization whose main mission is to promote cultural exchange between Japan and other countries, is also helping out by providing English tours of the Minamiboso region — which is how I ended up watching the ama divers last July. I was being shown one of the hidden gems that Terumi Kanaya, director general of the IAC, told me many people in Japan unfortunately miss out on. Though less than three hours by bus from Tokyo, Minamiboso has a tropical-like vibe. Palm trees dot the landscape, the sound of crashing waves is never far away and jaywalking isn’t a sin. Like most rural cities, the buses and trains don’t run every five minutes, so those not driving should expect to spend a fair amount of time walking or riding bicycles, which you can rent at one of the stations. Even if you visit by car, though, it’s worth taking the time to experience the sights on foot — there are marine-themed murals, squid drying on racks and colorful flora lining the streets and pathways, plus there’s the drifting aromatic bouquet of fish, flowers and the ocean. It’s true that some of the buildings in Minamiboso have seen better days, but what the city lacks in five-star resorts it makes up with decently priced lodgings right on the water. I spent the Marine Day weekend in Minamiboso’s Shirahama area at the Rise Resort, which was within walking distance of bars, a grocery store, the Ama Festival grounds and other tourist attractions. The modest accommodations were sufficient — two beds, a typical toilet and shower, and a balcony that, depending on your room location, either looks out to the sea or into a parking lot. The hotel’s buffet also showcased an abundance of local seafood, including crab, oysters and shrimp. Though scenic nature and tasty cuisine are perhaps the area’s main draw, Minamiboso also has its fair share of fascinating history. The city’s biggest claim to fame is the Nojimazaki Lighthouse. Before Japan opened up to foreign trade in the Meiji Period (1868-1912), the Anglo-Japanese Treaty of Amity and Commerce of 1858 demanded that the nation build eight lighthouses — and Nojimazaki became Japan’s second lighthouse after the Kannonzaki Lighthouse in Yokosuka, Kanagawa Prefecture. Like other buildings in Minamiboso, it has had its fair share of wear and tear. During the Great Kanto Earthquake of 1923, the tower was severely damaged. It was repaired, but in 1945 it was hit by U.S. Navy shelling. Touring the now fully repaired lighthouse is an interesting climb into the past. There’s a humble museum to peruse at its base, and after a short presentation our tour group squeezed its way through narrow stairwells, as we bumped our heads on the tiny openings, and made our way to the top. There we were greeted by a panoramic view of Minamiboso, where we could see the ocean, the mountains and the city all at once. After working our way back down, we took a short rest before the tour’s main event: the 50th anniversary of the Ama Matsuri — our a chance to see the famed ama divers. City officials of Minamiboso say ama have only existed in Japan and Korea and, according to Nagai of the Tourism Promotion Section, they have been around since the Edo Period (1603-1868). While many divers have collected pearls, the ama in Minamiboso have typically harvested sazae (sea snails), seaweed, oysters, sea urchins and other crustaceans from the ocean. As fishing techniques developed throughout the years, however, the ama have changed from gatherers that helped feed the town to a group performing a niche traditional custom. Yet in the past few years, diving has become part of pop culture in Japan. Two years ago saw the airing of the TV drama “Amachan,” which featured a high school girl training to become an ama diver, and the show quickly became a nationwide hit. The series is credited with reigniting interest in ama and helping boost local economies, with The Huffington Post reporting that the drama brought more than ¥3.3 billion of tourism revenue into Tohoku, the setting of the series. To offer people a glimpse of the real divers, though, the official Minamiboso YouTube account uploaded a promotional video featuring a visitor who is introduced to the tradition by a group of dancing ama. There is also a special tour offered by the city that includes local ama sharing their history while showing you the best places to collect seaweed and shellfish. Women tourists visiting during the Ama Matsuri weekend can even join the ama in the water and practice holding a torch while swimming. The festival began as a way to thank the female divers of the past and to pray for the city to be blessed with a good harvest season. 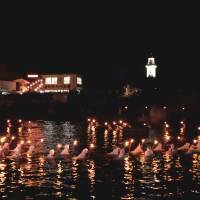 However, the main part of the festival — the ama swimming with torches — is based on a legend. The tale goes that on a particularly treacherous night, a boat sank near the shores of Minamiboso and many men were lost at sea. The ama searched for survivors that night, using bamboo torches as their only source of light. During the day, the Ama Matsuri is like any other in Japan — alive with food stalls selling sizzling pan-fried yakisoba noodles and other traditional foods, while taiko drummers entertain the crowds and a mikoshi (a portable shrine) is carried through the festival grounds. But in the evening it becomes a special event specific to Minamiboso. 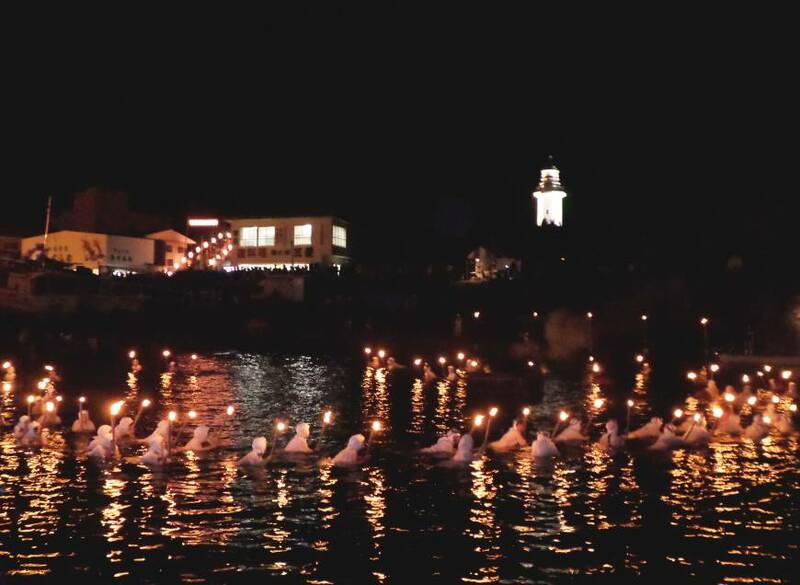 Around 100 women, dressed in traditional white diving outfits carry lit torches and pay homage to ama of the past by swimming in the landing dock near the Nojimazaki Lighthouse. They enter the water in pairs until the dock is filled with the dancing glow of torches. It’s a mesmerizing scene where the divers are illuminated only by their torches, the nearby lighthouse … and the inevitable camera flashes. 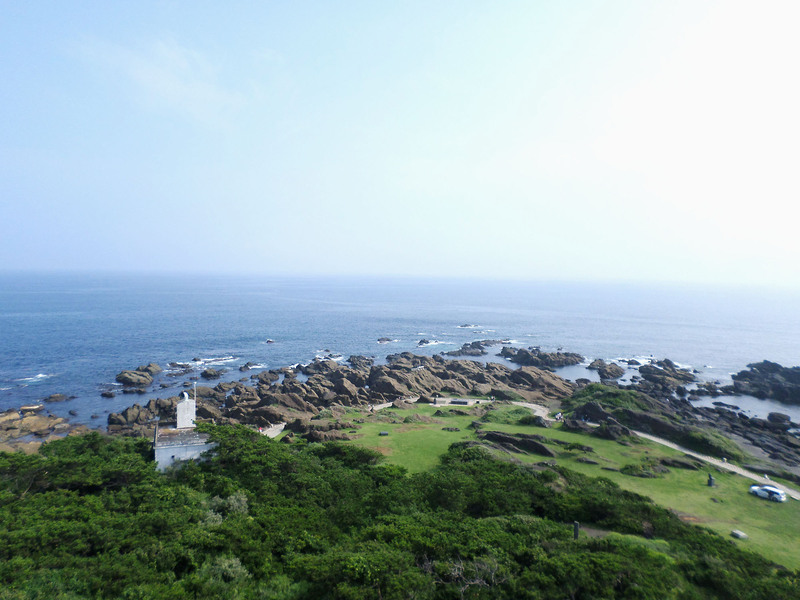 Minamiboso is a roughly three-hour ride to Shirahama on the Boso Nanohana Line highway bus from Tokyo Station. Local hotels Hotel Nankaiso and the Grand Hotel Taiyo are around ¥12,000 for one night and two meals, and the Rise Resort is ¥9,200. All three hotels are within walking distance from Shirahama bus stop and the Ama Matsuri grounds. This year, the festival takes place on July 18, 12-9 p.m. The ama divers will enter the docks from 8:25-8:40 p.m., and the spectacle will be followed by fireworks. Events not related to ama are also scheduled for July 19-20. Female volunteers who want to swim during the festival can sign up at tabihatsu.jp/program/90820.html. For more information, visit www.amamatsuri.com/wp.